Last Saturday, the men of UCCS soccer took on the Hardrockers of the South Dakota School of Mines in a tense match that ended with the Mountain Lions coming out on top by one. The game marked the end of the Mountain Lions’ regular season, with the postseason now well underway. At the end, UCCS celebrated their eighth conference win – their ninth overall. The game was an unusual one for UCCS, beginning at 11:00a.m. rather than in the afternoon. But that did not stop the team from capitalizing on an offensive effort midway through the second half. That effort led to a goal by No. 16, freshman Igor O’Rear, with an assist from No. 10, junior Alex VonHolle. The goal left three players on the ground, including Mines goalkeeper Kyle Daledovich. It was also O’Rear’s first goal of his career with UCCS. The game was marked by several tense moments. Nine fowls were given in total, including a few controversial calls that had both benches on their feet and drew ire from the thin crowd. Even with the tension, the play of the first half was characterized as being slow, a chance for the players of both teams to warm up and find their game. It was in the second half when UCCS turned up the pressure, and the rate of play increased. The tension also increased, yielding one penalty kick, one yellow card awarded to Mines, and the center referee confronting Daledovich over a controversy. At the whistle, UCCS quickly posession and moved for an attack, keeping the play on the Mines half of the field for the majority of the half. The Mines players warded off several shots in the process. One of those shots eventually found its way past Daledovich, guided into the net by O’Rear. 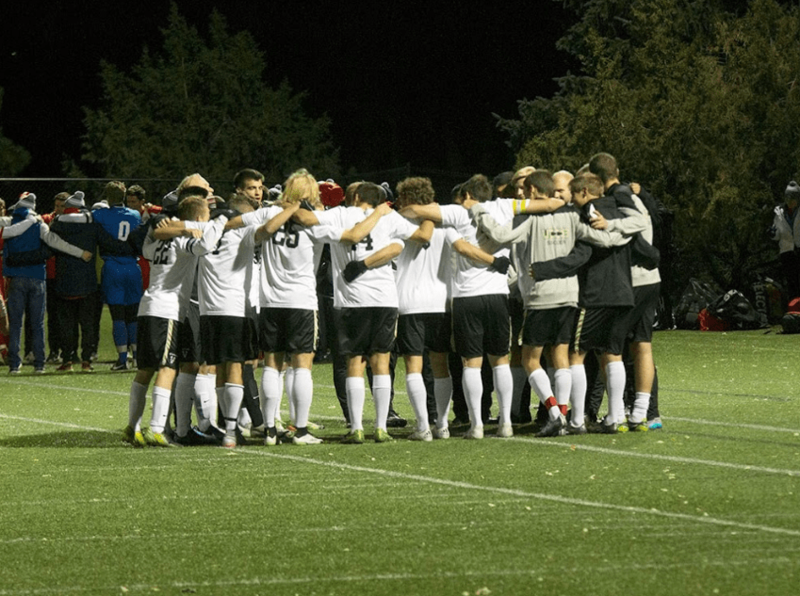 It seems that the efforts at recovery paid off, seeing as UCCS walked away with another win last Tuesday, getting revenge against Regis in the quarterfinals of the RMAC Tournament – something Miller said he and his team were really looking forward to. “We tied them here early in the season,” Miller said, referring to UCCS’ conference opener back in mid-September, “and then were up 2-0 at half a few days ago.” That second match ended with a defeat in overtime, UCCS losing 2-3. Looking at the results from last week, it seems the team got their revenge after all. Last Saturday was also Senior Day, being UCCS’ final home game of the season. After the game, UCCS’ lone senior, Corey Carabajal, was recognized and his achievements noted. Carabajal, a native of Albuquerque, is a four-year veteran with UCCS, and will finish his career at the end of this month. Carabajal, who redshirted his freshman year, is now the second-leading scorer on the team, with 11 goals of his career. He was also named to the 2018 RMAC All-Academic First Team, named RMAC Offensive Player of the Week back in September, and was an All-RMAC Honorable Mention. Having completed the RMAC Tournament last week, the Mountain Lions now look forward to the NCAA Division-II Tournament. This Friday marks the First Round, with the Finals on December 1.